Provided by Shabut Shagan-Web Sophomore Kaitlyn Smolar won three freestyle events this past weekend, breaking a program record on the 1,000-yard freestyle event. 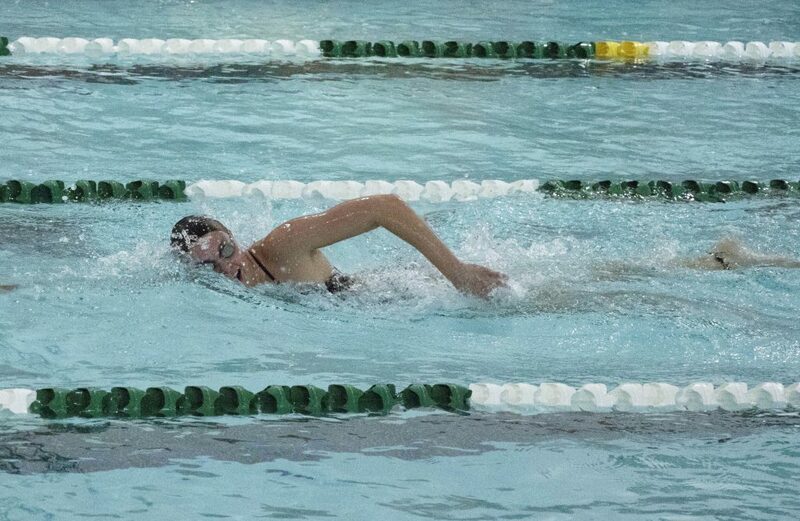 The Binghamton men’s and women’s swimming and diving teams concluded an undefeated fall season by conquering Canisius in its home territory on Saturday. The Bearcats dominated Buffalo’s Koessler Athletic Center with a 200-100 victory for the women and a 191-108 win for the men, earning a sweep. BU head coach Brad Smith attributed the team’s success against the Golden Griffins to an optimistic mindset and determination. Canisius did take top honors for the three-meter board event: Senior Vivian Mroz earned a score of 233.10 and sophomore Brett Palo’s performance merited a score of 276.53. Aside from that and a few other isolated Canisius victories, the Bearcats soundly defeated their host. The women were led by a pair of three-event winners, sophomore Kaitlyn Smolar and senior Brooke Pettis, as well as two-event winner, sophomore Erica Bachiller. Smolar dominated the 1,000 (10:18.78), 500 (5:05.90) and 200 (1:54.05) freestyle events. Pettis conquered the fields of the 200 fly, 100 fly and 200 IM with times of 2:05.15, 56.05 and 2:10.40, respectively. In addition, freshman Kelli O’Shea won the 200 breast with a time of 2:24.60, freshman Amanda McGraw placed first in the one-meter diving event with a score of 256.93 and junior Sydney Atendido dominated the 100 breast with a time of 1:05.75. The women’s showing reflects the nature of their season thus far, one distinguished by impressive team and individual performances. At the previous meet against Colgate, the 800 free relay team broke the record set by the 2006 Vermont team (8:01.12) with a time of 7:53.38. At the same meet, McGraw and sophomore Sophia Howard qualified for the NCAA Zone Diving Meet with scores of 270.83 and 284.32 for the one-meter diving event (the minimum score to qualify is 265.00). Smolar, a member of the record-breaking 800 free relay team, broke a program record (10:22.96) in the 1,000-yard free on Saturday that has stood since 2012. The men have also turned in noteworthy team and individual performances this autumn that continued on Saturday. Four men won two events: Senior Alex Brion dominated the 50 (20.75) and 100 (47.10), senior Zachary Kaplan won the 100 back (51.75) and 200 back (1:55.48), junior Ross Bernstein swept the 200 fly (1:53.83) and 200 IM (1:53.96) and sophomore Patrick Wilson won the 100 breast (57.73) and 200 breast (2:05.50). Single winners included senior Max Willard in the 1,000 (9:50.25), sophomore David Walters in the one-meter diving event (274.05) and junior Dylan Van Manen in the 500 free (4:45.90). Walters qualified for the NCAA Zone Diving Meet with a score of 313.80 (the minimum qualifying score is 300.00) in the one-meter event at his previous meet, highlighting the success of Binghamton’s divers. Smith stated that their triumphs have elevated the tone of the whole team. The team’s performance is particularly notable considering there have been unforeseen issues with scheduling and injuries. However, Smith noted that the team has not let it affect its depth or attitude. The Bearcats look to carry their momentum at Marist on Jan. 12 at 1 p.m. from the James J. McCann Recreational Center in Poughkeepsie, New York.